We have opened a sister company to our clinic! Learn the four pillars to health and wellness! 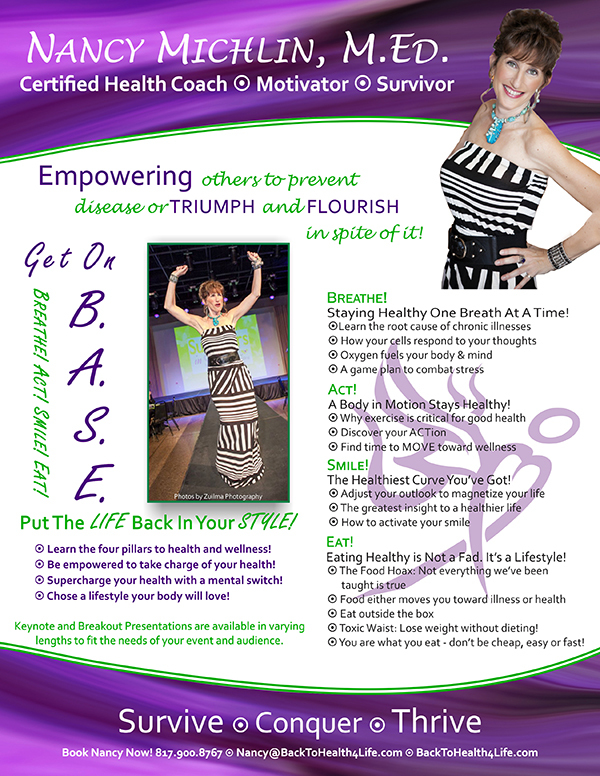 Be empowered to take charge of your health! 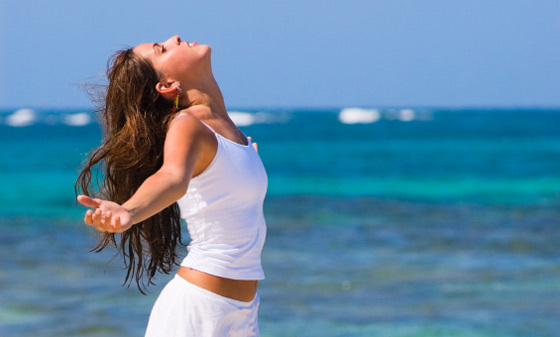 Supercharge your health with a mental switch! Choose a lifestyle your body will love! STAYING HEALTHY, ONE BREATH AT A TIME! Learn the root cause of chronic illnesses. How your cells respond to your thoughts. Oxygen fuels your mind and body. A game plan to combat stress. A BODY IN MOTION STAYS HEALTHY! Why exercise is critical for good health! 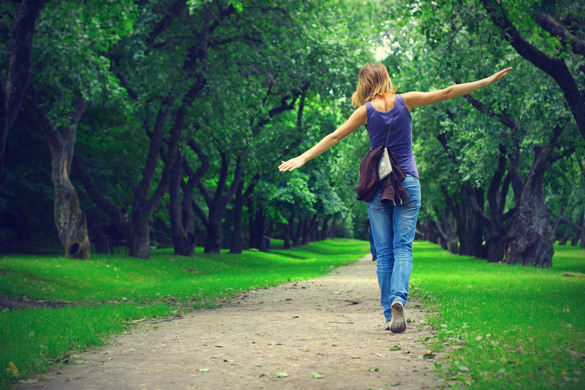 Find time to MOVE toward wellness! THE HEALTHIEST CURVE YOU'VE GOT! Adjust your outlook to magnetize your life! The greatest insight to a healthier life! 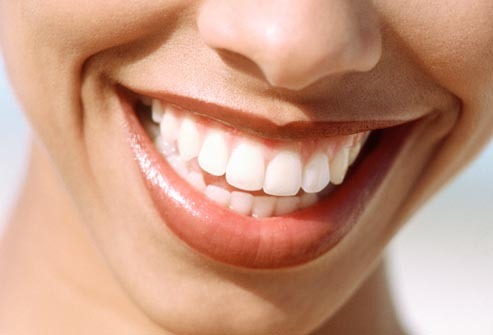 How to activate your smile! EATING HEALTHY IS NOT A FAD. IT'S A LIFESTYLE! The Food Hoax: Not everything we’ve been taught is true! 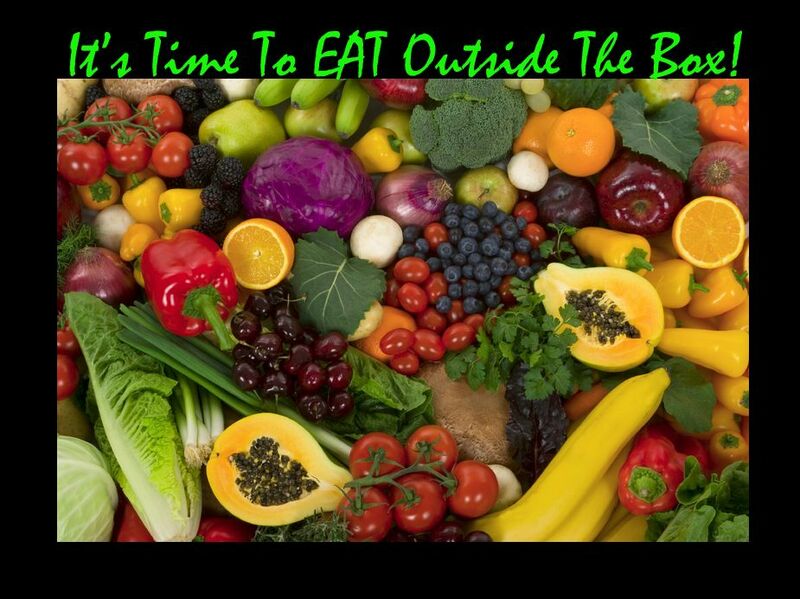 Food either moves you toward illness or health! Toxic Waist: Lose weight without dieting! Meet Nancy Michlin, our Certified Health Coach, who can help you become empowered to make healthy lifestyle choices! While Nancy loves her position as the C.E.O. of Back To Health Family Chiropractic, her passion is coaching and educating patients on the health and wellness. Nancy thought she was living a healthy lifestyle. It was when she was diagnosed with breast cancer in December of 2011 that she realized there was much more to truly living healthy. Thus began her quest to learn as much as she could about the pillars of whole body health. She transformed her entire way of life. Her story was featured on CBS11 news in Dallas/Fort Worth and is posted on The Next Chapter Medical City Dallas, the Susan G. Komen Fort Worth, and I Fight Like A Girl websites. Nancy was also highlighted in the video Stripped: Deconstructed & Reconstructed. Nancy has a Master’s degree in Instructional Systems Design. She is a Wellness Consultant, Certified Health Coach and Motivational Speaker on the principles of living a healthy lifestyle. Nancy’s mission is to educate, inspire, and empower others to make healthy life choices to prevent disease or triumph and flourish in spite of it! Nancy has given motivational presentations all over Texas on a variety of healthy living topics, designed to meet the needs of each audience. Just to name a few of the organizations, Nancy has inspired people at Medical City Dallas, Center for Cancer and Blood Disorders, YMCA, Willoughby Half Way House for Boys, Over 40 Females, and Own Your Own Universe Women’s Retreat. She was also a guest on Love, Trust, & Pixie Dust Radio talk show. 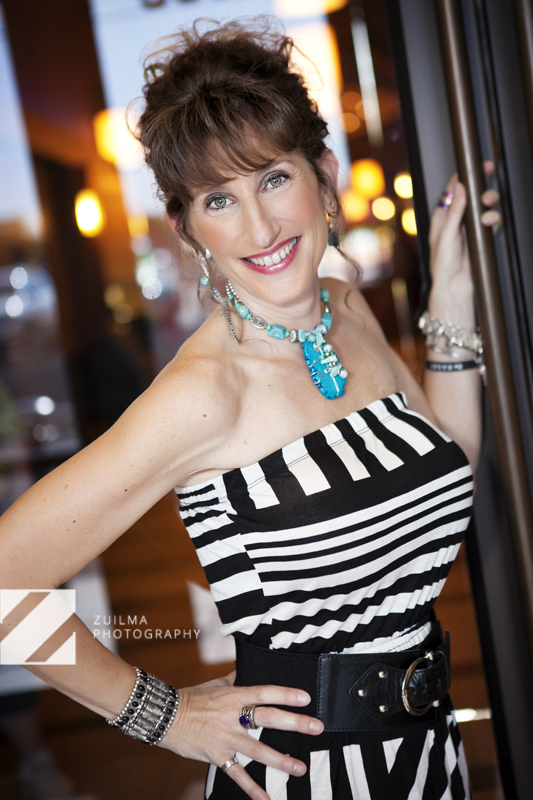 Nancy’s energy is contagious, and she is devoted to energizing others to take charge of their own health! Let’s all get Back To Health 4 Life! Listen to Nancy sharing tips on healthy eating during the holidays and beyond! Nancy's segment starts at the 32.13 mark and concludes at the 58.03 mark. Click HERE or the player below. 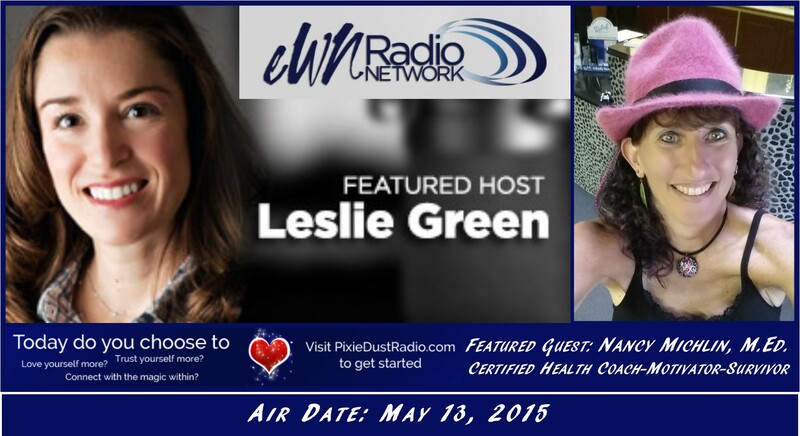 Listen to Nancy talking about health and wellness on EWN Radio Network! Nancy does not know this, but the first time I heard her speak, I found myself jotting down so many 'golden nuggets,' that at one point I simply took out my phone and began voice recording her—just to make sure I didn't miss anything! And I'm so glad I did. Once I knew I was not in jeopardy of missing anything, I was able to sit back and enjoy the presentation. Had I continued to feverishly take notes, I would have missed soaking in Nancy's high-energy style, which was equally as mesmerizing as the content was compelling. P.S. You are a fabulous speaker! And I'd love the world to know it! It is my honor to speak out about you!!! Your presentation was REALLY inspiring Nancy. You blew my mind. Thank you so much for ‘going there.’ Your writing was off the charts wonderful too. I am so proud of you!! You are a real hero! Nancy is a truly gifted speaker who inspires as well as provides practical guidance for better health. She graciously shares her time and expertise with our women’s cancer support groups. Each cancer survivor who attends her presentations has been uplifted! I had the opportunity to listen to a wonderful, well spoken, very informative speaker, and her name was Nancy Michlin. She was a guest speaker for a breast cancer support group, Simply The Breast, held at the Center for Cancer and Blood Disorders. She was enlightening and well diverse on the matters of healthy living for women diagnosed and who have gone through cancer treatment. She gave great information to ponder and take action on the betterment of our lives. I believe that her knowledge was well received. Nancy Michlin ROCKS! 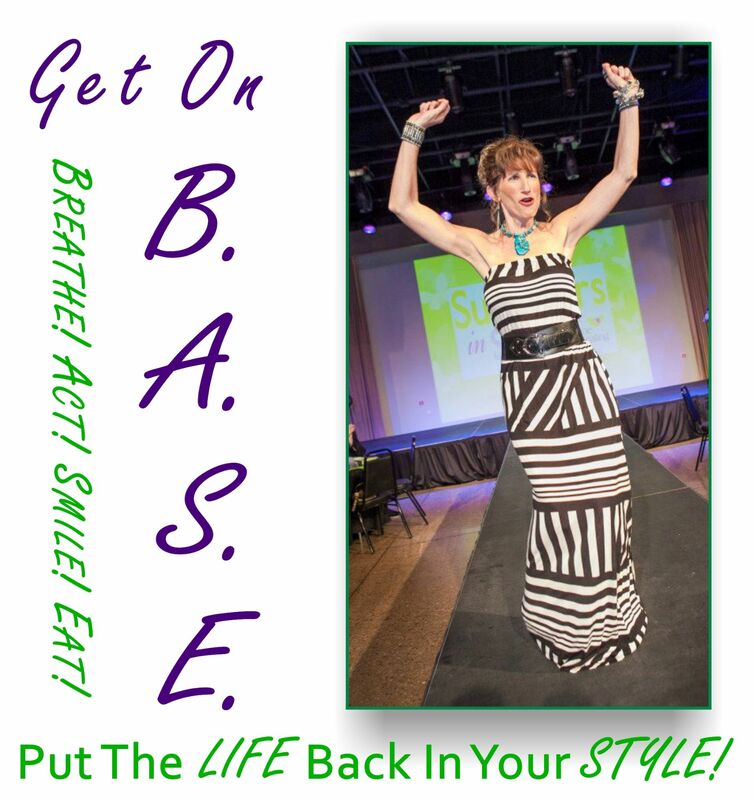 I want you to meet Nancy L. Baskin Michlin, Breast Cancer Survivor, Motivator, Author, Healthy Lifestyle Coach and Over 40 Females Speakers Board Member. She is strong woman who is deeply educated about being healthy through food, physical activity and attitude. She is a listener and an advisor. She has poured into me in subtle and sweet ways that I so much appreciate. She is speaking next week at the Ft. Worth Over 40 Females Fort Worth event and you don't want to miss it. Most importantly, if you are looking for a Healthy Lifestyle Coach and maybe you don't even know what that is then you should call Nancy at her office! Nancy gave a presentation to gynecological cancer survivors tonight. One of the survivors, who had seen Nancy present once before, told the group how she just had to come when she heard Nancy was presenting. This woman drove to Dallas from Plano. Here's the kicker, she was hosting a bridge game AT HER HOUSE TONIGHT!! She was late to her own gathering, so she could hear Nancy present!! When she first arrived, she said, "Just seeing you inspires me!" What a huge honor! Click the image below to bring up a downloadable file of Nancy's speaker's sheet.